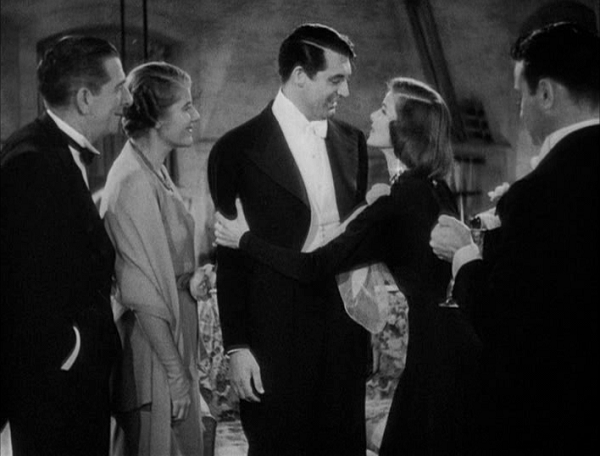 Three cheers for Johnny Case (Cary Grant)! Here’s a man who understands the value of hard work, but more importantly, understands that hard work should be actually working towards something. And Johnny means to find out what that something is. Case — often confused with “Chase” by those whose minds tend to stay focused on finance — doesn’t give a hill of beans for amassing a hill of dollars. He follows his gut, and it’s a sorrowful moment when he betrays it. But only a moment it is, because this guy knows what he wants, and he knows he’s right. And even faced by those who would tear down his dreams, he sincerely apologizes for not giving them the opportunity. A finer hero you couldn’t dream of. Three cheers for Linda Seton (Katharine Hepburn)! She’s the black sheep of a blueblood family, and she’s damn proud of it. She doesn’t linger in the “playroom” because she’s trapped in childhood, but because it’s the one place in the gigantic mansion where her spirit flourishes. She’s a fine judge of character, and knows instantly whether someone belongs in the playroom club or not. She sees what others don’t. She’s a wellspring of goodwill, and a roaring geyser of charm. When she knows she’s right, she’s painted as stubborn, but she sticks to her principles. Her willpower also comes in handy when holding back her desires for the greater good. She’s a heroine deserving of standing ovations. Three cheers also for Nick and Susan Potter (Edward Everett Horton and Jean Dixon)! Loyal, witty, playful, endearing. The kind of friends who will stand by you when you’re right, and give you a swift kick in the pants when you’re wrong. Quick with sarcastic quips and even quicker with good old human kindness. Dinner conversation with these two must be a delight. These are the folks you want on your side, and want to go on holiday with. Three cheers even for Ned Seton (Lew Ayres), the youngest sibling but with the weight of the sacred “family name” on his shoulders. Although younger, Ned is a picture of what Johnny could turn out to be if he’s not careful. Stuck in a passionless job, stuck in a bottle. Don’t worry, Ned, we’ll come back for you. This entry was posted on October 8, 2014 at 8:52 pm	and is filed under Movie Reviews. You can follow any responses to this entry through the RSS 2.0 feed. You can leave a response, or trackback from your own site.